It has been requested that additional images be uploaded for this article. Remove this only when the image(s) have been uploaded for this article. Specifics: Both N64 & DS versions. Notes The first course of Future Fun Land. 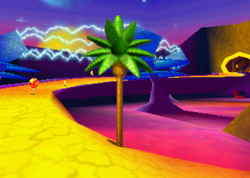 Spacedust Alley is the first course of Future Fun Land in Diddy Kong Racing and its remake, Diddy Kong Racing DS. From the start, players ride their vehicle across the landscape, passing through zippers and also avoiding trees. Afterward, the player enters a tunnel with one of Wizpig's spaceships. It tries to shoot the player, and the lasers can be avoided by driving to the sides of the track at that point. There is a fork in the road after this part, where the player may either take a bridge or go under it. Either way has a zipper. From that point, the track has many twists and turns inside the cavern, making it easy for racers to crash. Finally, the player exits the cavern and crosses the finish line. In the Nintendo DS remake, the track mainly remains the same as the original, although Wizpig's ship is a bit easier to avoid. Trees in the beginning are also replaced by lighthouses, and the music is changed to the theme from Spaceport Alpha. This page was last edited on December 20, 2018, at 00:03.